Moth Ball Armadillo Repellent - Do Mothballs Work? 11.18.2004 - I am annoyed at mothballs. Somehow, somewhere, someone got the idea that mothballs would repel wildlife. Now I encounter mothballs on a weekly basis - inside homes occupied by animals who don't give a crap about mothballs. Armadillos are just one such animal for which people use the magic cure-all critter repellent, mothballs. 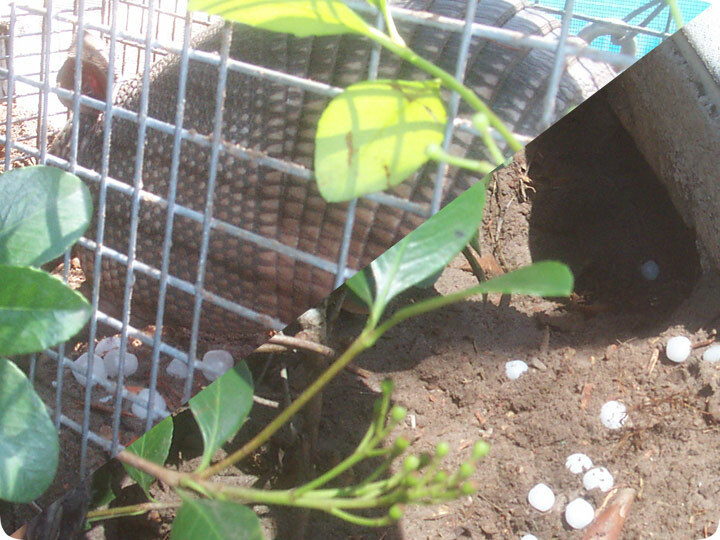 Thus, this homeowner dumped a box of moth balls down this armadillo hole. Amazingly, the armadillo didn't care. As you can see in the above photo, lower right side, the armadillo continued to use the burrow, and some of the mothballs got dragged/kicked out as the animal went in and out and dug as part of its normal business. Then in the upper left side you see the armadillo captured in a cage trap filled with mothballs as bait. That's right, I used mothballs as bait as PROOF that armadillos are not repelled by mothballs. Heck, maybe they're attracted to mothballs. Regardless, mothballs, made of napthalene, are annoyingly common in do-it-yourself armadillo control and wildlife control in general. Mothballs do not repel armadillos. Mothballs do not make good armadillo repellant, I mean repellent. You can't keep armadillos from digging by using moth balls. If you must do something yourself, as opposed to hiring a trapper to remove the armadillo, at least place a large blockade over the hole. The animal will likely dig around it, but at least it's better than poisoning the earth with toxic mothballs. Liquid Solution To Armadillo? When you go to a hardware or gardening store to look for help in dealing with an armadillo problem, you will often find many different products that promise to be able to repel armadillos from your garden or yard. The problem with these products is that they are at best unreliable, and in many situations they are completely ineffective, and are a complete waste of money. The reason for such liquids not being able to provide a solution is that most repellents will have the scent of a predator to drive the animal away, but armadillos in North America have no natural predators. There are also a number of different home remedies and solutions that are touted online, with mothballs, human hair and a chili solution all being circulated as possible armadillo repellents. These are also generally ineffective, and dealing with an armadillo infestation will be something that will require a more practical approach, with trapping and exclusion both providing a good way of dealing with armadillos. Many people have often spent hundreds of dollars trying to solve an armadillo problem using repellents, but the best thing to do is to avoid spending money on these products and pursue a realistic solution to the problem.